All fly lines have three main components that make up their initial performance standards: core, coating and taper. Modern fly lines are made over a level core that is coated with a polymer compound. The core of a fly line may be made from a single strand of monofilament, braided filaments or unbraided filaments. This is the part of every fly line that is responsible for most of the over-all tensile strength of the line. A flexible polymer coating is flowed over the core of the line and forms the outside diameters, tapers and exterior coating to the line. Through the addition of minuscule air-filled glass balloons or fine metal powders to the polymer mix the line will be either lighter or heavier than water, and it will either float or sink. Pigments might also be added to the polymer mix and determine the color of the line. As discussed above, every modern fly line is built on a core line that gives every finished fly line its tensile strength. These core lines can be made from single strand monofilament or multistrand braids. Every manufacturer of fly lines uses a variety of core lines to build their fly lines upon. Each core will have specific characteristics that will affect the performance of the finished fly line. We have already mentioned tensile strength. Most cores used for Spey Lines are 20-pound test to 35-pound test. Braided Multi Strand Core has been the most popular material for most fly lines for several reasons. Fly line coating adhere to braid easily and braid has little if any memory. Depending on the type of braid and the type of coating layered over it the texture of the braid surface has shown trough to the surface of the fly line. This textured fly line surface has been touted as reducing friction. Today there are many other ways to that are more controllable to reduce surface friction of fly lines. Primarily color, density, and tapers are controlled by the surface coating of each fly line. Before the advent of polymer coatings (around the end of WWII), all these factors were braided into the fly line. Today fly line taper is controlled by first coating the core with a polymer mix and then running this coated core through a die that can change diameters. The die controls the diameters of the fly line and forms the fly line taper in the fly line coating. Up to this point fly line manufacturing is all pretty much the same. All fly line construction machinery and processes are jealously guarded company secrets. But some things are known. Airflo Fly Lines are made from polyurethane (PU) Which comes in a pelletized form and must be heated to become a liquid, which is forced into the machinery that coats the core and controls the taper of the line. Then the line is cooled before it can be spooled. Airflo claims great advantages from using polyurethane. They certainly do build great fly lines. To our knowledge all other fly lines are made with polyvinyl chloride (PVC). This substance is mixed with liquids into a compound which is allegedly about the consistency of cake batter then forced into the machinery while at comparatively low temperatures. The fly lines then run through a heated curing chamber and are cooked into their pliable solid form. This process also produces excellent fly lines. All modern fly lines are made using materials that make them lighter than water. This is because tiny balloons are incorporated into the polymer mixture. Some fly lines also use surface structures that trap air and others use chemicals that repel water to make the line float even higher. When building sinking lines, the floating micro balloons are replaced with metal powder (usually tungsten) in the polymer mix. Sinking lines sink because they are heavier than water. How fast a line sinks is dependent on the ratio of the metal powder to polymer plastic in the mix. This is called “sink rate” and it is described in “inches per second”. For instance, a type-three-line sinks at three inches per second. A type-six-line sinks at six inches per second. However, this definitive system is going out of favor. Spey line sinking tips are now often designated as how many grains per foot they weigh. These tips are often designated as T-7, T-8, T-10, T-11, T-14, T-17, and T-20. The “T” stands for tungsten, and the number stands for the amount of grains per foot it weighs. All “T” lines are loaded with the maximum amount of tungsten powder the polymer will structurally hold together. Therefore, they all sink extra fast. Since all of these lines use the same size cores, the core to coating ratio is higher in the heavier lines. Cores are usually neutral density. So heavier lines are denser than lighter ones and they sink faster. Heavier tips retain more kinetic energy during a cast and will turn over larger, heavier flies than lighter weight ones. Single Density means that a line or line tip is made from the same material for its entire length. 2D means that a line or line tip is made from two different densities of materials, such as a floating line with a sinking tip. These kinds of lines have been made for years for both single-hand and two-hand casting. 3D means that a line or line tip is made from three different densities of materials, such as a floating line with an intermediate slow sinking mid-section and a faster sinking tip. To our knowledge the first of these lines to hit the market was Airflo’s revolutionary F.I.S.T. Skagit head. Because of the extra density materials employed, F.I.S.T lines cast farther and sink deeper than floating heads. 4D means that a line or line tip is made from four different densities of materials, such as one-quarter floating line, one-quarter intermediate slow sinking, one-quarter type-3, and one-quarter faster sinking type-5. These types of both Scani and Skagit heads are now being made by RIO. Fly lines are built with tapers to facilitate both casting and presentation. In the first writing in the English language tapering lines made of horse tail hair was discussed. Since then the art and science of tapering fly lines for specific purposes has become paramount in fly line design. 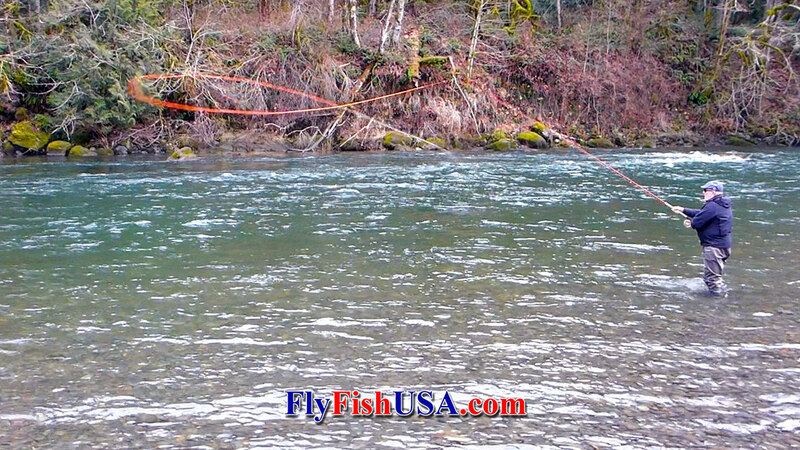 During every cast, a fly line extends itself by rolling down a loop. A fly line can still have forward momentum as long as it is in the loop. As soon as the loop is completely unrolled, most of the forward momentum is gone. Front tapers dissipate energy and slow down turn over and extend flight time, as well as allowing a line to come straight before landing. In the beginning, before the invention of the fly fishing reel a line was attached to the end of the rod. Casting distance was limited to the length of the rod and reel. This not only hampered the distance an angler could cast, but also the size of fish that could be landed. People were fly fishing for trout in the British Isles in the 1400’s. Doubtful that the fly tackle of the time was strong enough for Atlantic salmon, or even larger trout. By the nineteenth century, fly reels, rod guides and braided fly lines became available. Now larger fish could be subdued with fly tackle. Fly lines were made from oil treated silk. Line tapers started to evolve and line guides on rods allowed longer casts to be made by shooting line. In comparison to the graphite rods and polymer coated lines that we have today, nineteenth century tackle was less forgiving, less reliable and far more expensive. The first tapered lines were level (having a constant diameter) for their entire length with a taper only at the front end. Eventually someone figured out that if a taper was incorporated at each end, the line could be turned around when one end wore out. The next step was to develop a weight forward line with a smaller diameter integrated shooting line so that line could be extended during the cast. Salmon rods of that time averaged sixteen to twenty feet long. Anglers at the time figured that they could cast a line of three to five lengths of the rod.So, with a 20-foot rod a 100-foot cast was theoretically possible (if one was strong enough and skilled enough). If anglers could shoot line, they could cast even further. In those days fly fishing rods were all made from wood, and actual rod weights weren’t measured just in ounces, but in pounds and ounces. It soon became clear that it was more efficient to scale down the rod and learn how to shoot more line. Yet because the fly lines at the time created a lot of friction in the rod guides, shooting long distances of line wasn’t practical. Long rods of fifteen to eighteen feet in length remained popular, and so did long belly fly lines. The longer the belly, the longer the fly line stays in the loop while casting, the more energy it retains, the longer flight time and the further a line can be cast. In our era, all successful competition Spey distance casters use long belly shooting head fly lines. I asked world champion Spey distance caster, Travis Johnson what are currently the most popular head lengths of lines for competition in the 15-foot rod division? His reply, “Head -lengths of 69’ – 72’ for men, and 62’ – 66’ for women”. That is 4.1 to 4.8 rod lengths for line head lenghts. Those kinds of lengths take a lot of room behind the angler and a lot of skill to cast. Travis set the world record in this class of 198-feet. Few anglers in the United States fish with these kinds of lines. Longer belly fly lines are a disadvantage when fishing windy, or heavily vegetated rivers, or when using sinking tips for fish that won’t rise. They do retain popularity with a small segment of the Spey community who fish Atlantic salmon or summer steelhead in large rivers with wide flood plain gravel bars. These same anglers use traditional long rods, or they scale the length of the head-portion of the line down to fit shorter rods. A popular line for anglers who want to cast further or do less stripping is the RIO InTouch Mid Head Spey line with a head length of 52’ – 60’. Skagit lines are specifically a Pacific Northwest Invention developed primarily by winter steelhead anglers for casting large weighted flies, and for fishing them deep. While much research and development was going on simultaneously on many rivers, Washington’s mighty Skagit River got the credit…and rightly so. It happened on the discussion group, Spey Pages. Ed Ward was enlightening the group about a new form of Spey casting/fishing that he and his friends were experimenting with on the Skagit River. A gentleman from UK wrote that no way could this new-fangled fishing-style be called Spey casting because no one used that kind of tackle and methodology on Scotland’s Spey River. So, Ed agreed, and said it would then be called Skagit Casting. Originally, these new shooting head lines were made from level pieces of 12-weight fly lines about 30-feet long. These lines are now referred to as beer can Skagits, since they had no taper at either end. A length of sinking tip was added to the forward end with a braided loop to loop connection. Different lengths of sinking line could be exchanged. These lines worked okay, and lighter weight sinking tips acted like a front taper. But, in comparison to the Skagit heads that are available today these beer can Skagit heads were crude and clunky. Now Skagit heads are tapered at both ends and the trends for both the Skagit heads and the rods used to propel them, is that they are both getting shorter.RIO was the first company to sell a production made Skagit line on an industrial scale. It averaged 27-feet long, had a rear taper and an integrated shooting line. It was very successful. But it was the Airflo Skagit Compact that really made Skagit style fishing the popular sport that it is today. Want to know more about fly lines?